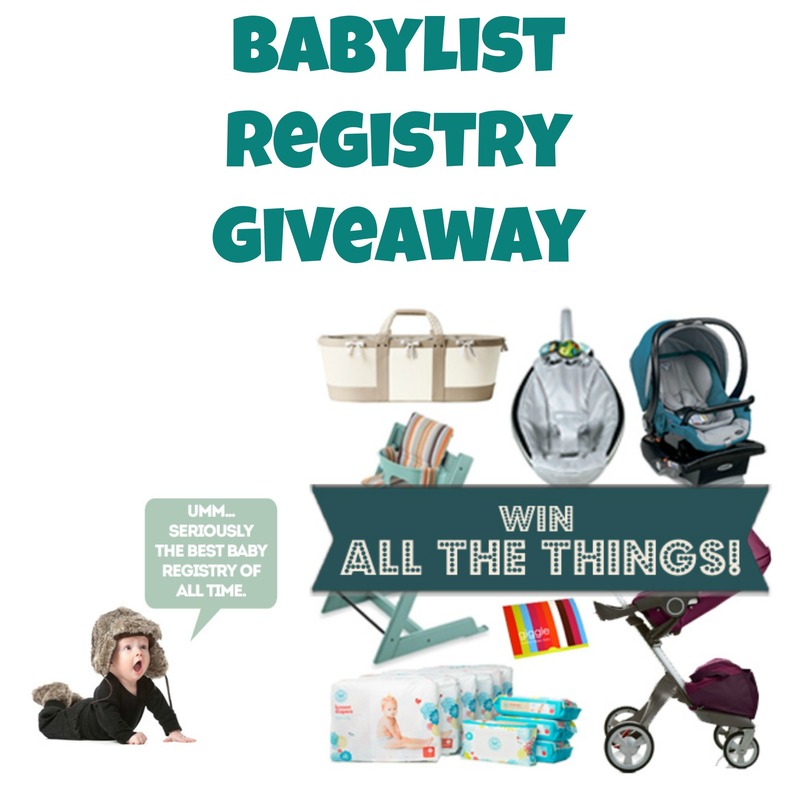 Today we’re giving away some great new baby products that we love! 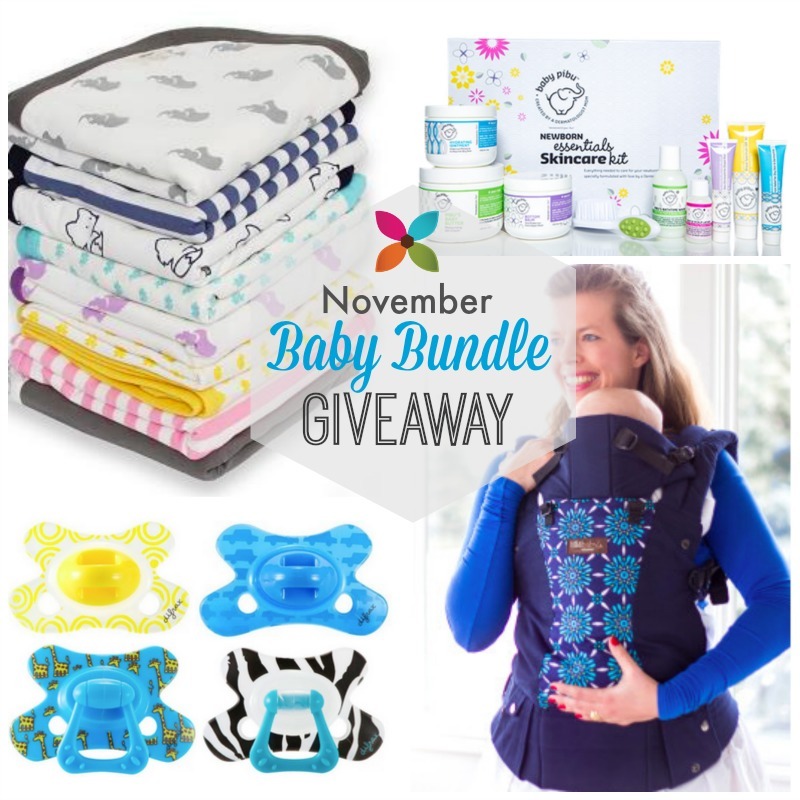 As parents, we want only the best for our babies, and these companies all know that and deliver on creating great quality products that we believe in.Introducing the monthly Baby Bundle giveaway! The baby carrier is my number one baby accessory, hands down. Babywearing has become a part of life for me, and I love it so much. 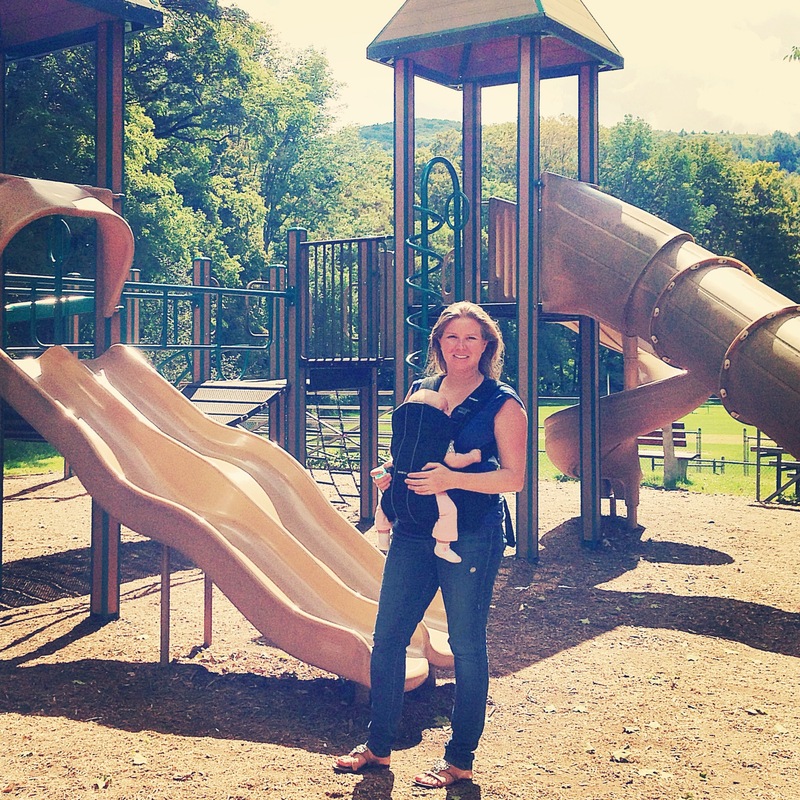 It allows me to be hands-free and mobile, so I can get things done and still have a happy baby! Enter the Lillebaby carrier. If you have a baby of your own, you understand the importance of keeping him happy at all times, to avoid stress and general craziness in the household. I’ve found that when he’s fussy or upset, I can just strap him onto my chest and he’s instantly calm and soothed! It makes sense, doesn’t it, that being strapped close to mama or daddy is his favorite place to be? Lillebaby makes the most comfortable carrier, with a great back support and padded straps so both baby and mom or dad are happy! This particular carrier is 100% organic cotton, making it so soft and it comes in a pretty blue celeste pattern that we love. 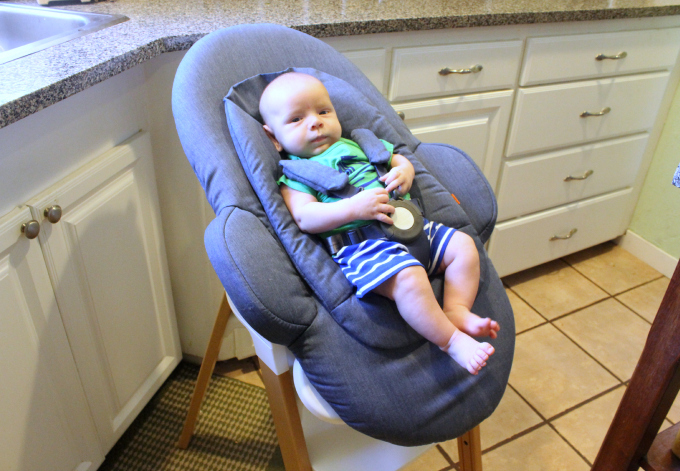 You can even carry baby front-facing, rear-facing or on your back! With a variety of positions and the softest fabric, you are going to love the Lillebaby! Next we have these great Monica + Andy muslin and cotton baby blankets. They are so soft and well made, and perfect for your baby’s gentle skin. I love the size of them, too, as they are great for tummy time, to keep baby warm, as a stroller cover or even a nursing cover! The prints they have to choose from are super cute, too, with the foxes and elephants being my personal favorite. Monica + Andy uses superior fabrics and carry products that are both chic and comfortable, with quality you can feel! Another company I’ve fallen in love with is Baby Pibu skincare. This line was developed by a dermatologist mom, so you know you can trust the products they make, which are all geared toward healing and protecting infants, toddlers and kids. All products are hypoallergenic, irritant free and fragrance free- all very important for your sweet baby’s skin! I especially have been loving Pibu’s Baby Butter skin cream and Diaper Rash ointment. 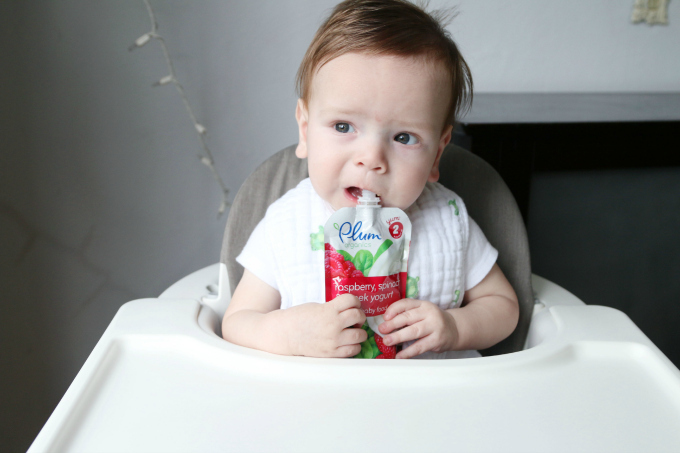 The Baby Pibu products feel luxurious and I love that they are made with Baby in mind. What’s colorful, trendy, and cute all over? The hottest new pacifier designs from Difrax, of course! The award-winning Difrax 3-Stage Pacifier System meets all of the needs of your child’s developmental stages. Difrax pacifiers come in two distinct styles: Classic and Orthodontic and each style has a 3-stage design to accommodate baby’s growth and development. Each pacifier style has a butterfly shape designed to prevent the nose from being obstructed and the added holes in the design allow for sufficient airflow to reduce skin irritation. Known for their on-trend, colorful pacifier designs, Difrax has added stylish and fashionable new designs to their collection! Now it’s time for the giveaway, who wants to win all of these amazing products? Benjamin loves cuddles! He loves to be held and snuggled and kissed. He’s so calm too. Having the prize pack would be wonderful since I never had a baby shower for either boys and could only afford the basics for baby. I have a $17 carrier that sure needs upgrading. My little guy isn’t here yet, but when he arrives I would like to have a little something special ready for him! I’d love to try the super soft blankets, and the sensitive skincare products sound amazing! I want the best for my son, and winning this giveaway would help us both a lot! My baby boy is so happy all the time! He just smiles all the time and I love it!! Would love to win!! I have three little kiddies that make me smile everyday. They are so sweet. this will be my third and likely last baby. I am just starting to regularly feel his flutters and nudges so this is my favorite part of pregnancy! I would love to win because my old gear is worn out after going through my two older boys! I’m a Mom of 4 girls with 9mo twins! I’d love to win because, well…. Twins are expensive and we’ve had to start from scratch with baby things for them. Would love to win for my baby due in April! I need this stuff! Baby girl is Lillie so definitely the Lilebaby carrier! My little one loves “bonking” everyone…she will tip her forehead into yours as she says “ba” and then breaks out in giggles. It’s the cutest thing and I can picture her doing it with her little sibling that is on the way. Winning these items would come in handy for my soon to be little one! My sweet little one just started talking to the point where we understand what she wants and it’s no longer baby babble. I’d love to win! I’m a mom of 4 and everything here would help soothe mom and baby! I could use all the help I can get! Thank you! I love the I yuv you mommy! I love the snuggles and the sweetest hugs and telling me it’s ok if I get hurt! So much to love and be thankful for when you have a child. My daughter is 2 1/2 and I have loved every minute since her birth! I have another one due November 23rd and can’t wait for all the sweet moments times two! I am preggo with #3, I finally my baby girl after 2 boys! Thank you! I’d like to win for my baby girl. She deserves the best and she would love to be in a carrier! Levi is 2 months old and has just started smiling when he is talked to. He especially loves talking when being kissed, read to, and of course while he’s peeing during diaper changes. My little girl is so active; I know she’s going to be a firecracker once she’s born! Little Sawyer is incredibly sweet tempered, and I would love to spoil him with some of these prizes! My little one gives the sweetest hugs and kisses. This is a great giveaway! I’m obsessed with babywearing! My daughter Niamh Rain (irish name, pronounced Neave) is a year old and my 4th baby. She is the spitting image of her dad. She looks just like him when he was a baby. She is the most curious out of the rest of the kids, shes a dare devil for sure but sweet and LOVES to Laugh. I would love to win this for her! My Bruce is a wild child, all day, every day I chase him around. I practically have to steal cuddles, unless I am baby wearing him. If he is on my back he rubs my sides and says aw..his way of lovin’s. When on the front he often reaches up puts one hand on each cheek and lowers my head down for kisses. Sadly though he is currently outgrowing his current carrier at a fast pace! I am pregnant with my second and I am thinking that a carrier is going to be a must with a toddler around! After my first I was surprised by how much Ioved babywearing! We would love a little extra help preparing for this baby girl! Mommy to a sweet little girl with another on the way very soon…would love to try some new products with this one. This is my 3rd and most likely my last I would like to enjoy him the most I can. He is the sweetest and most calm baby always with a smile. I currently have a 2 year old daughter and am pregnant with our second rainbow baby! It took 2 miscarriages before we had our daughter, and two, including the loss of our second daughter at 9 weeks, after to hopefully have our second healthy baby. Our daughter won’t quite be 3 when this baby comes, and I would love to try a different carrier! My sweet little boy has recently started grabbing for my face and trying to kiss me. I would love to win because I love baby wearing! My baby is a very bad sleeper ( almost 10 months old and he’s not any better ) , I mostly walk around half awake , but he has the best laugh , nothing sounds more amazing to me , that beautiful sound makes me forget all the sleepless nights! Eilidh is our third and she’s always quick to give out the smiles or a sweet baby coo. I love how much her brother and sister love her. They never leave her alone. My sweet baby LOVES to be worn so I think that lillebaby would be wonderful. My daughter is so sweet these days and can’t wait for our next baby to be born! My baby girl has changed my life in such an amazing way. She’s sweet and funny and loves to dance and I couldn’t imagine a day without her! I would love to win so we could use all these amazing goodies from some amazing shops! Thanks for the chance! I have a Lillebaby and love it. My son has been worn in one since he was born. He is almost 1 and still loves it. If I won this I would give it to my friend who can’t afford one. Braylon loves to snuggle up on my chest in his carrier like a sweet newborn (6 months old) then look at me blowing raspberries. He then bursts into laughter, it’s shows his amazing personality. All of these products are so wonderful!!! I would love to win 🙂 I am a m of one and am currently expecting. I would reccomend all of these products to my mommy friends. I hope they all enter to win too! I have heard great things about lillebaby carrier. I hope I get to check it out with my 6 month old so we can keep up with her big sisters! We have a baby boy due in March and I would love this for him! Baby is learning to play peek a boo and its so fun watching her giggle and smile. We enjoy babywearing, but our stretchy wrap is not working so great as baby gets heavier. 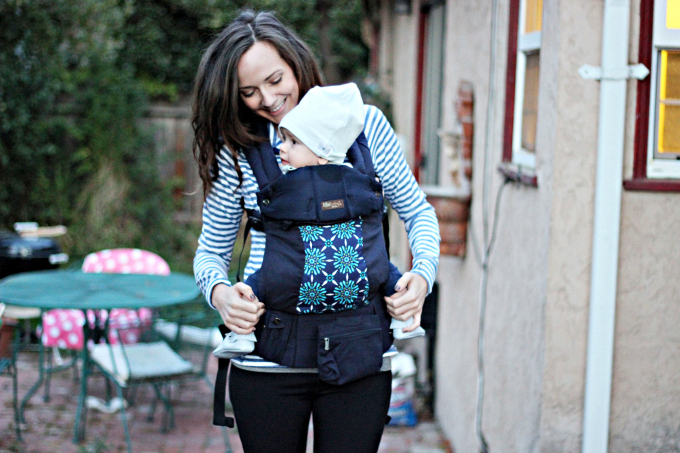 We would love to try a SSC, and I’ve heard great things about the Lillebaby carrier! My daughter had surgery at 4 days old and has recovered beautifully! She is such a happy baby and never seems to “complain”. We are so grateful for her everyday! Sigh…at least autocorrect didn’t make it sumo day. I meant sonogram… might even try for a 3D! I have a chunky 8 month old and would love to have a carrier like this to give my arms a rest! Such a great give a way! I would love to win as we are currently TTC baby #2! My lil’ girl has a hilarious laugh/giggle/cackle. We borrowed a lillebaby from our local babywearing group and we are loving it. It would be great to have one of my own. Lorcan came out wide awake and didn’t even nap until almost 1 am after his birth. He wanted to discover everything immediately and still does. He is so curious and never takes no for an answer, 9 months later. My little guy is the sweetest little boy and little flirt. His big blue eyes and sweet smile melt my heart everyday! This is an amazing giveaway! My fingers are crossed in hopes that we win. My baby’s smiles are THE. BEST. THING. EVER! I couldn’t love being a mom any more. I want to win because I love baby things. I keep finding more and more products that i just can’t live without. My baby is such a sweetheart. I can see our characteristics in him and it’s so cute to see them in baby version! I’m hoping to win so that we can use the carrier for when we bring our precious bundle to meet his relatives in Korea! My little just LOVES people – no one is excluded. 😉 Thanks for the giveaway! I actually want to win the for baby J who is due in Jan.
My baby loves to snuggle up when she first wakes up! and she just smiles the biggest smile! Priceless moments! I want to win because I am about to be an auntie! I would love to win as I am pregnant with my second (just found out it’s a boy!) and we didn’t save a ton from our first baby since we moved across country since she was born. This is an amazing giveaway! My son loves babywearing so that he can help Mama. I would love to win a Lillebaby so my son is cuddly close and safe from harms way.He is extremely busy…. Now, that is an understatement! Great products, but I would love to win the carrier! Our sweet baby isn’t here yet – arriving just after Christmas 🙂 But, I love that his big brother & sister were praying for a little brother and now he’s almost here!!! I’d love to win for him! All of these products look wonderful. Thank you for the chance 🙂 With a 3 month old all of these would help tremendously. I love new products. Number 4 is almost here and number 3 hasn’t realized he isnt the baby anymore-i see a lot of baby wearing in #4s future!!! My daughter is a surprise baby. My husband had a vasectomy 8 years ago. I refer to her as my little hitchhiker. I have some serious neck and back issues and my current carrier is making it worse and this baby loves to be worn. Working on the baby! We would love to win because we are money crunching so I can stay home! This is my first baby and we have tried 7 years for our sweet bundle of joy! I want to win since I really need to stock up on baby gifts since we are expecting soon! My baby is 10 months old today, and I’d especially like to win the carrier for her! Love to win all of this for my niece! She just had twin boys on 11/7! She could really use this! Thank you! Expecting baby #1 and we are beyond excited. We have been waiting a long time for this baby. Would love to win these wonderful products. Since our baby isn’t here yet, my favorite thing so far has been hearing the heartbeat and feeling the baby kick. Can’t wait for more. My baby isn’t here yet, but he will be the first boy in my family in several generations so he’s extra special! I have 2 babies 🙂 my baby baby is 8 weeks old and loves to smile! and my older baby is almost 2 and is a proud big brother! I am currently pregnant with my first, she is due in March 🙂 I love the carrier, so much nicer than the ones I have seen. My daughter is 17 months old. We’re potty training our son right now and suddenly she points to her diaper when she’s gone potty and will go lay down to be changed. She’s very insistent we change her quickly. lol I cloth diaper and will be sad if she potty trains soon! I’m pregnant with number 1 and would love to win! It’s overwhelming how much you’ve got to get for a baby! My baby is awesome because he’s given me a very easy pregnancy. I’m very lucky! The sweetest part of my day was filled with my baby girls giggles and smiles:) & my two toddlers art work that they colored for their momma couples with their hugs & kisses! There’s no greater Joy than the blessings of children . I would love to win this lilliebaby carrier for my 5month old ~She loves to be held & be close to her momma. I know this carrier would get lots of Love and would be a Big help. So that I could be the best mom possible to my 3 little girls! hearing my son calling me mommy, telling me how much he loves me & getting hugs and kisses everyday/night is always my fave. now that I’m pregnant i love to feel my baby’s movement/kicks and hearing his heart beat. i would love to win coz its going to be a huge help for us to not buy any of this essentials specially we are on our way of moving to another state after my son is born so there’s so much gong on & financially it is going to cost us a lot. huge thanks for the chance! Something sweet is that I can’t WAIT to meet him/her… it’s a surprise! My little one isn’t here yet, but the anticipation of the arrival of my little peanut is the best. I would really like to win (especially the baby carrier). Our new little guy, Alistair, loves to be held and cuddles. Just saw our first baby on the ultrasound for the second time – can’t wait for this little one to arrive! Every time her brother comes into the room she lights up. I’d love to win because it’d be something to look forward to due to daddy/hubby being deployed this holiday season. Baby boy loves being held and carries around. He loves looking around at everything. Hoping to win, what a great giveaway. I want to win for daughter who is having her first baby. Her and her husband have done so much for so many. They spent the past three years teaching English in America Samoa. They are having to buy lots of things since they sold most of their money to pay for their expenses while they were there the first year. I am expecting baby #2 and this has been an amazing time. I didn’t think I could love anyone more than my daughter, but as soon as I found out about this baby I immediately felt love. My daughter’s smile brightens my day, hearing her first words, and now she is going to be a big sister. I would love to win because I really need a baby carrier with a toddler and new baby on the way, and I love lillebaby. Chasing a toddler around would be much easier with a good carrier. I already follow and love all the other products as well. Thank you so much! We’re on our second baby now and most of his things (besides clothing, since our first was a girl) are hand-me-downs. It’s nice to be able to treat him to something that wasn’t used by another baby first! This is my first pregnancy. A little gentleman. I would love to receive win all these great items. 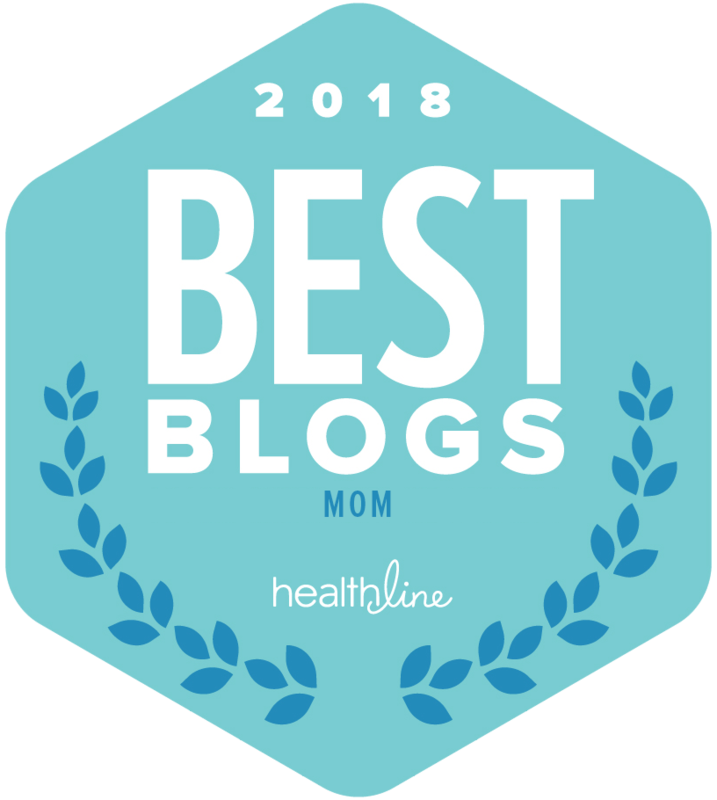 I had the opportunity to meet the Dr. who created the skin care products, but at the time, I was in the process of scheduling my pregnancy, IUI. I also would like to own a baby carrier! Baby isn’t here yet, but all these products would be perfect to welcome LO home! I really like the baby carrier and the cute patterns on the blankets! My son is about to be a big brother and I know he’s going to be the best! These products would really help us out with baby #2. My baby girl loves animals and we want to win because that carrier is so beautiful! I would love winning this!!! My little guy loves being carried & I’ve been wanting to try a Lillebabby carrier! My 8 month started clapping and it is too cute! Everything my baby does is my favorite, but I just love hearing her laugh. Its just the best way to cheer up any day. I would love to win, so that we can go for walks in the lillebaby carrier. We didn’t have a baby shower, so this would be so lovely for the new baby. My sweet baby boy reminds me that all this hard work is going to be the best for our family every time he gives me his little fluttery kicks in the morning. I would love to win this for him. I would love to win this as my little one loves to be snuggled close and also has sensitive skin & eczema issues. What’s sweet about him is when you hold him, he will put his little hands on either side of your face, look right at you, and smile or rest his face against yours. He can’t say I love you in words, but things like this speak volumes. I have three children and my youngest is the sweetest most cuddly baby so far. She loves her brother and sister and she mimics everything they do! She dances and sings. And she is just starting to walk! I would love to win this for her! My daughter is 3 and my son is 7 months. Nothing makes me happier than seeing them play together. They love each other so much already. My daughter is 4 months old and I was able to catch her first giggles on camera! The sweetest thing is watching my baby’s reaction when Daddy gets home from work. He bursts into this big gummy smile and starts wiggling around! My husband’s reaction to this is almost as priceless. I love how he snuggles in under my chin and sleeps! I would love to win this for my niece! My baby girl has the sweetest little cleft chin-she gets it from her daddy. I have no idea why I didn’t try baby wearing with my first baby. I’d love to try it for the second! My youngest is 1 1/2 but I would love to win this for my brother and his wife who are expecting their first. my baby isn’t born yet but I’m sure will be a sweet little guy. I’m already so in love with him. My little guy loves to be worn and that baby carrier looks amazing. He and I would both love it! My baby boy lights up as soon as you walk in and gets so excited when he is happy. I haven’t met him yet. After donating all our baby things and thinking we were done, I was blessed with a baby boy due early next year. Our new 1 month old has recently started smiling at our 21 month old, it melts my heart, it is so sweet! This stuff all looks super snuggly for my little guy! I’d love to win so I could do lots of extra snuggling my sweet girl with those blankets that’s due in just three weeks!! My son Jasper is 3 months old and has had such a rough little start to life. He’s much healthier now and his little smile makes my heart swell. I would love to win these goodies for him (and for me!) because all of it just looks so cool. The carrier is beautiful and I’d get a ton of use out of it. The skincare line I would probably even use on my toddler who is currently experiencing some really dry skin issues due to the rapid change in weather. 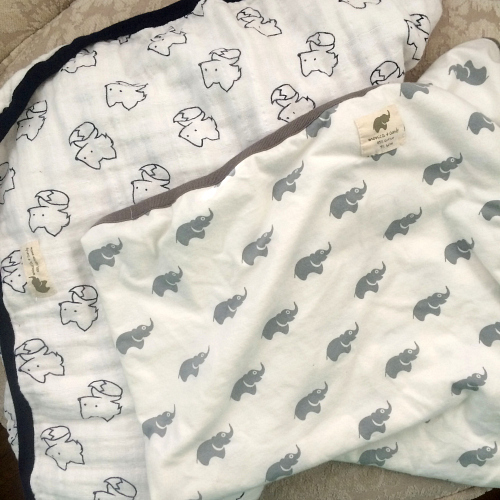 The blankets are absolutely adorable (I love elephants, they are our theme!) and the pacifiers and cute, too. Would love to win this giveaway for my baby girl due March!! My sweet little man hasn’t made his appearance yet but I love feeling his little kicks. I would love to win to be more prepared for when he arrives. My sweet angel is a month old. Shes my first and im going through some marital issues so it be nice to be able to spoil her. She loves to cuddle and smile! such a sweet baby. My little guy is almost 8 months now and is so sweet! Everyday when I come home from work I am greeted with the biggest smile and it’s the BEST feeling in the world! All of these products look amazing and I would actually love to share them with one of my three pregnant besties 🙂 I am so excited for the journey they’re about to begin! My kids are so sweet, they make me such a better person every day! I am amazing how sweet, snuggly, caring, genuine and hilarious my kids are! I am so very blessed! My little guy is the sweetest more caring little boy ever and he loves to cuddle. I can only hope that our next baby that I’m curently pregnant with is as sweet and loving as he is. I would love that carrier and those blankets. Great giveaway! Both of my granddaughters are sweet, they love their cuddle time with Grandma. They love each other and it’s so cute to watch them play and giggle together (they are 3 and 1). They will have a little sibling in April 2015. What a great bundle of baby products. I would really love to win this one!! my son is my fourth child but the first with blonde hair and blue eyes! he looks nothing like me or my husband. i find it so funny every time i gaze at him. First off this is all SO darn awesome, thank you for the uber sweet chance!! Let me tell you about our luv bug on the way… she is going to be one loved little soul & have the best big brother ever. We tried & tried & she is finally on the way!! P/S she really loves chocolate peanut butter ice cream & taco bell at 10pm) Lol. My baby is 3 months old and his laugh is contagious! My princess is so sweet because she has such an contagious laugh she makes me smile any time of the day no matter what she can make anyone’s day jolly again. And for that I love her to the moon and back! I would love to win this for her and my first niece on the way and would be honored to win this so I can give her the cutest and best baby products! The first rule to my parenting style was to teach my son his manners, and its definitely paid off. Everything he does and ask for, there is a please and a thank you. People compliment me as a parent on those things and its definitely a sweet feeling of joy. I have always loved all the snuggles and sweet little smiles that come with that. I am pregnant with my second child and I already know my daughter is going to be a great big sister. At 16 months, she loves to share and tries to comfort other kids if they are upset. I would especially love to win the carrier to carry around the new one while we are out and about with our oldest. My baby is the sweetest, most cuddly boy. I would really love the pacifiers and skin care line for him. My grandson is a sweet, smiley infant, and I would love to give these gifts to him. When he smiles, his whole face lights up and he kicks his little feet – melts my heart! My baby is the sweetest baby with a smile that never fails to make everyone happy! Great gifts I plan to give to my niece for her baby due Dec. 30! Love to get her little man a head start. My sweet Sawyer Bean is the joy of my heart! He is a miracle in the midst of a frightening circumstance and I thank Jesus for his life everyday. This single mama would love to win some goodies for her man cub! my baby is number 4 and just loves everyone. she aches for attention and will say “hey” until someone looks at her. My daughter just had a beautiful baby boy and I would love to win this for him. Really love being a Nana! My grandson, Henry, is the sweetest little fella in the world, always laughing, snuggling, and smiling. I don’t know what I’d do without him! I’d like to win because now that I’m retired, I can’t afford to buy him the things I want to give him, things he needs. Thank you for the chance! my little one loves butterfly kisses. I would love to win for him! We are expecting baby #6 in less than a month. This little one will have LOTS of hand-me-downs, but I would love a few new things. Lillebabe has been my all time favorite carrier, but my old one began to fray, so we need a new one no matter what! Grand babies are Gods’ way of making aging easier! My husband and I were in school when we had our kids and EVERYTHING we had were all hand-me-down and it will be so great to give this new baby something new! Expecting our first after a long road with Fertility treatments. This would be perfect! I am obsessed with my son who was born on my birthday and he has the cutest laugh and smiles that lights up his face esp when he sees his sisters! but would love to win this for my lil sister who is being induced today to have her first baby! Love all these products and she def needs them! i dont have kids, but have friends that 2 young kids, they own a pet store where i shop, the are so cute, love animals, love to feed the dogs treats when they come in the store. I just had my son on veterans day and he was 1 month early. He got jaundice, and lost week. He is now doing so much better and is such a good boy. My lil man #2 is just 2 months old and he is so sweet. He’s just started to smile and grabbing stuff. I also have a 3 yo lil man #1 who is a sweet Dusty Crophopper obsessed boy. I would love to win this for lil man #2. He’s getting all hand me downs and not a lot new stuff to call his own. And the Lillebaby carrier would help me be able to hold him while chasing lil man #1. My little guy is almost 8 months. He is already developing a sweet little personality and loves to give kisses. I would love to be able to spoil him with this baby bundle! On my worst day, a smile can make everything better! Baby # 2 is due in 3 weeks this would be great to win! My son is three months old and is 6 ounces away from doubling is birthweight, I need a supportive carrier for my chunker!! Would love to win this for my little one arriving next year. I really want the lillebaby for our second baby! My sweet 1 year old is finding her inner struggle with emotions. She flushes the toilet and it scares her but also excites her so she keep sdoing it. Her expression of terror and curiosity is priceless. My baby is still in my belly, coming in the spring, but he/she is starting to move around, which is so sweet to me! I am currently pregnant with baby #6 🙂 We moved last year and I gave away all my baby stuff, so it would be great to win! My baby loves to smile and giggle. One of his favorite things to do is hold my hair and look at me! We are trying to conceive baby #1 so This package would help us to prepare for baby! Our littlest is now 8 mo. & just soo sweet. Her smile is charming & she just loves making new friends. I’d love to win these products- some to share & some to enjoy with our little lady! My little man loves to be held and snuggle. I am a first time mom and am pregnant right now due at the end of January so this would be perfect to get some items that and help save money for this baby coming. My baby is very active and likes to kick when my 2 kitties come lay on my belly and purr to the baby. We are waiting to find out what we are having too. My 5 month old is just starting to be his own little person. I am expecting my 4th baby… He was a surprise as I didn’t plan for more babies so I’m starting all over. This is a great giveaway and we would love to win! I love my little girl’s spirit and animated face when she talks with me and the mirror. She loves to snuggle. I want to win cause we cannot have too much of some of these things and we are hoping to have more kids and possibly a boy so neutral stuff would come in handy. I have awesome three and two year old little girls that are so excited to be getting a little brother in march! Would love to be able to wear him in a cute carrier!!!! My baby has the sweetest smile and eyes, she is so beautiful! I would love to win because I am addicted to soft baby blankets and would like to check out these from Monica + Andy! My little one has started rubbing/patting my back when i carry him….It feels so nice to be comforted by someone so small! My baby is just now learning how to walk and it is so cute to watch him find his balance and make those first steps. I want to win this because I would love to have a baby carrier. My Gabby is such a sweet baby who adores her big brother. I would love to win this because all the prizes are great. This would be great to have for the holidays! My son loves to smile a lot! I would love to win this for my sister-in-law! My son has a deep belly laugh! I can’t help but laugh every time he laughs! I would love to win this for him, so many great products! I’m due to have my first child in less than one month. These items would be a huge help! I am anxiously awaiting the birth of my 1st grandchild, a boy! My daughter still lives at home, so I will be very close to him! She is such a good kid! okay so you know how in Dear John their thing is “So I’ll see ya then”… ours is “I love you so much” – absolutely melts my heart!!!! I’d love to win because Christmas is around the corner and we could use as gifts for family and friends. I have the best little 3yo boy any mom could ask for. And we’re waiting for little boy #2 to arrive in February, so this carrier would be for him. I am going to be baby wearing a lot if I’m going to be chasing around my other son all day! Baby girl is 3.5 months old and the light of our lives. She has recently begun to giggle when daddy and I kiss her, but what she likes most of all is to be worn in her stretchy wrap. She’s a solid chunk of a baby though, and I think something like the Lillebaby would be much more suited to her physique. Oh my goodness my babe gives the BEST smooches and squeezes. Big old wide mouthed smooch and puts her hands on your cheeks to pull you in. So dang cute! I’d love to win for her upcoming sibling! Proud momma of a 3 month old son and a 6 year old daughter. They are my world! My daughter is the most sweet, kind heart’ed person you will ever meet. My son is the apple of not just my husband and I’s eye but our daughters. He is soo in love with his sister and the bond that I see between them is unexplainable. They just have so much love for one another and it is just amazing to see how they will grow to be. My daughter is the sweetest and kindest little soul. She is truly my miracle baby. Several doctors told me I would never be able to get pregnant even with infertility drugs due to a severe medical problem. Well it took several years but my husband and I did and all natural! My daughter is very special and caring little girl. My wife and I tried a few years to have her. I almost lost my wife because she had a surgery to try to fix her medical condition so we could have a chance at having a baby. The doctors were preparing me that she could die. But god had other plans. Not only did my wife recover but a few short months later we found out we were pregnant. I am very blessed to be given an awesome little girl.